Strobilanthes (also called Persian Shield) is a tropical, evergreen sub-shrub that produces soft green and silvery-purple foliage on large leaves that can grow up to six inches long. These upright growers can be used in landscaping or indoors as a houseplant. In zones 9-10, Persian Shield will continue to look great all year long. In zone 9 (and occasionally in zone 8), it will die back but resprout in the spring if the roots are properly mulched. As a houseplant, Strobilanthes can survive for years under proper care. Homeowners will need to take special care to make sure the plant stays in a humid area with morning sun and mid-day to afternoon shade.House plants will need to be misted several times a week to maintain humidity and moisture levels. For best results with Strobilanthes, we recommend using a constant feed program of 150-200 ppm N. Persian Shield are not drought tolerant and should not be allowed to dry out completely between waterings. They also perform much better in high humidity. Maintain a pH between 5.8 - 6.2. We recommend that you pinch Strobilanthes Persian Shield 5-10 days after transplanting to your final container. They may require a second pinch to shape the plant for your final needs. Persian Shield produce small violet flowers, but they are not very attractive and pinching can be done at anytime if you do not require it to flower for your final application. Strobilanthes will flower under short days, so use night lighting to prevent flowering. Plant growth regulators are not recommended for Strobilanthes Persian Shield, but pinching and trimming will be necessary as these are fast-growing, upright plants. Encourage basal branching through proper pinching. Watch out for spider mites and the occasional aphid or mealybug on Persian Shield. 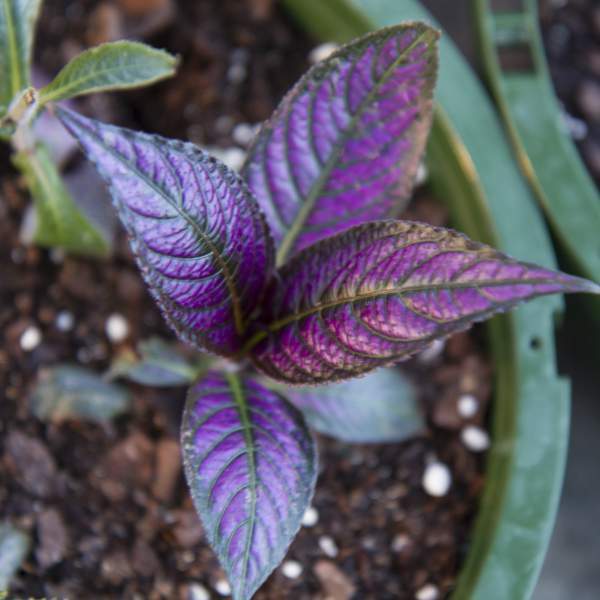 Strobilanthes Persian Shield is not prone to many diseases, but don't oversaturate the soil. If the plant sits in moist soil for an extended amount of time, you could end up with root rot or botrytis. Botrytis grey rot is usually associated with wet or humid conditions. You can prevent botrytis by allowing the plant to dry out between waterings, allowing for good airflow in your greenhouse, and spacing to allow the sun to penetrate to the soil level. The most common chemicals used to treat botrytis and root rot are Medallion and Banrot. Use them as a drench according to each label's instructions. We recommend planting 3 starter plants per 1 gallon pot. Use a well-drained soil in your containers and plant your starter plants deep, allowing the ellepot to be completely covered by the soil. If you are planting 4" pots, 1 plant per pot should be sufficient. Plant it directly in the middle of your pot.